Today’s Book Talk post comes courtesy of Saundra Mitchell, the extraordinarily gifted author of Shadowed Summer. Ms Mitchell is celebrating the paperback release of Shadowed Summer by going on a “30 Days of Summer” tour. I’m very excited that she decided to stop by The Serpentine Library to talk about Southern Gothic fiction. I love fiction with a voice of its own, with an atmosphere that transports me to that place and time, so that I live and breathe- and sweat- with the characters. And sometimes, the only thing that does it for me is southern gothic fiction. My own novel, SHADOWED SUMMER, is set in the stultifying heat of a Louisiana summer for just that reason. When I visit schools, I define southern gothic as "It's hot in the south, and it makes you a little crazy." And while that gets a laugh, it's not the whole picture. Southern gothic fiction engulfs you in the American south. First, in the broad, expected strokes of humidity that drips down the windows, and accents rich as brown clover honey. Then secondly, and more importantly, in the details. Southern Gothic goes beyond the cliché of the southern belle and the good old boy, to introduce you to the real south. Devilled eggs with filling that's gently pink, and never, ever gaudy baby-duck yellow, the warm friendliness you find even in strangers at the cheese counter. "Bless his heart" is a magical phrase that lets you precede it with, "He's dumb as dirt and ugly as sin," and get away with it in polite company. A casserole is currency. Thirdly, and finally, is the voice. You can write about the south with a Yankee voice, but it just won't be Southern Gothic. The grammar, the vernacular, and the accents are part of what makes the south a world apart- we are what we speak, and the south has its own language. Kami Garcia and Margaret Stohl's BEAUTIFUL CREATURES is sprawling, magical epic- full of prophecies and doomed love, but also filled with fork biscuits and The Way Things Are Done in Gatlin, South Carolina. And if you've already savored the dark arc of Lena Duchannes and Ethan Wate's destiny, I can tell you, you're in for a treat when the sequel, BEAUTIFUL DARKNESS, comes out this winter. BREATHING by Cheryl Renee Herbsman is set in coastal North Carolina, about a girl named Savannah who believes the only thing keeping her breathing is her first love, her true love- a boy from Greenville named Jackson. Lesley M. M. Blume's TENNYSON captures completely a southern family clinging desperately to their ancestral plantation house as it falls to pieces, and a young woman who's been abandoned but dreams of being something more. A big THANK YOU to Ms. Mitchell for Book Talking with us today! I lived in the South for a year when I was a kid. It's lovely to be able to revisit the South in YA lit. There is definitely something distinct about the South, but unlike the other major regions in the US, the South is the easiest to romanticize in a book. It's in the little things, as Saundra said. I've read Beautiful Creatures and now I'm going to get my hands on a copy of Shadowed Summer. Great post!! I love Southern fiction. Beautiful Creatures is one of my favorites. 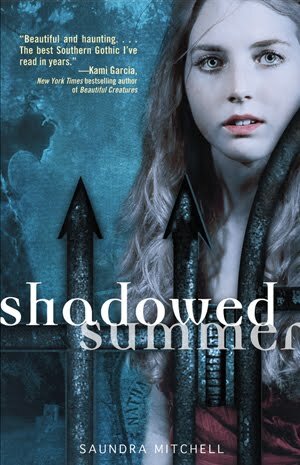 I will have to add Shadowed Summer to my TBR list. Great post!